That sounds right to me Ed. 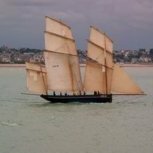 I am coming home on the morning departure from St Malo in September. Is breakfast on offer from when we board or do we have to wait for lunch if we want to eat? Yes, the self-service should be serving breakfast but the waiter-service restaurant will be closed. Hope that helps. Ed.